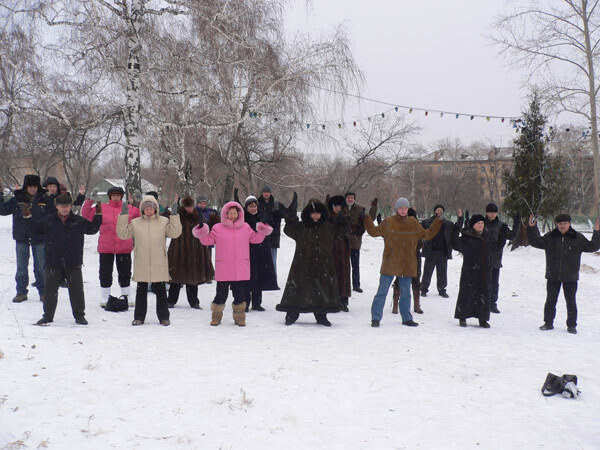 From the 3rd to the 7th of January 2007, Krasnoyarsk in Russia hosted the first Siberian Falun Dafa Cultivation Experience Sharing Conference. Practitioners attended from various cities including Krasnoyarsk, Tomsk, Kemerovo, Novokuznetsk, Ulan-Ude, Irkutsk, and Abakan. After the conference, practitioners organised a demonstration of the Falun Gong exercises outside a Chinese market. They distributed leaflets to Chinese people in the market, including forms specially designed in Chinese for quitting the Chinese Communist Party (CCP) and its affiliate organisations (the Youth League and the Young Pioneers) so that Chinese people could choose a bright future for themselves by filling them out. In order to gain a deeper understanding of the situation in China, Chinese practitioners in attendance shared their personal experiences of the brutal persecution since the evil CCP started the crackdown. Even their loved ones and the general public, who were poisoned by the evil party, exerted huge pressure on them. When they were detained, they went on hunger strikes. 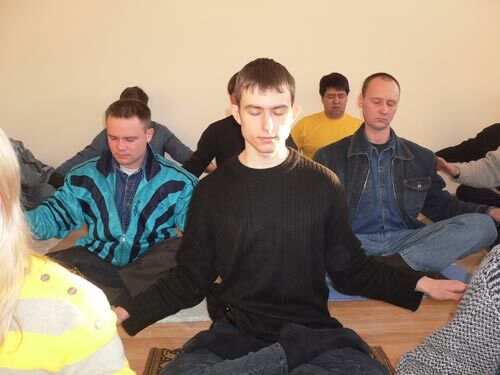 They also recounted stories of how the evil party tried to brainwash them, of the loopholes they came across in their understanding of the principles of Falun Dafa, etc. 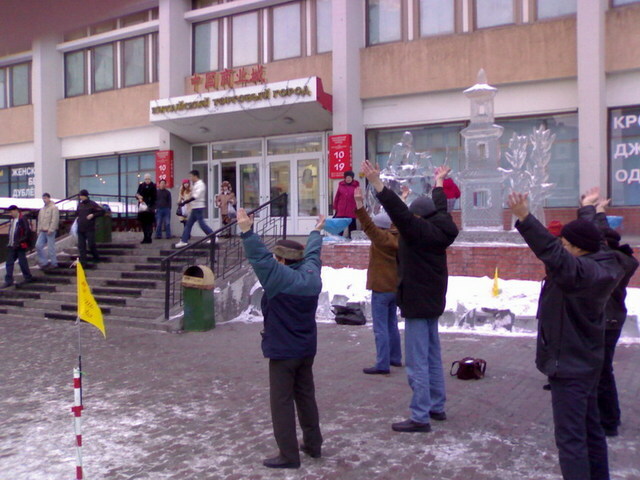 One practitioner recalled that when the evil CCP started the crackdown, in order for her to give up practicing Falun Gong, her mother locked her up in her room and poured liquor and chilli sauce down her throat. Her mother even beat her up with a stick until both of her hands were severely swollen. The evil party’s persecution made the mother disown her own daughter. Upon hearing these, Russian practitioners raised a question, “Why did it go as far as this?” Chinese practitioners answered: in order to really understand and to better save the precious Chinese, one had to understand the Chinese way of thinking and the poison of the party culture. One had to read the Nine Commentaries on the Communist Party carefully. The party culture corroded the Chinese way of thinking so badly that the mother mistreated her most beloved daughter to the extent of disowning her, all because the evil CCP slandered Falun Gong. Many Chinese had unconsciously become a part of the evil CCP, which was why it was so difficult to recall their conscience. 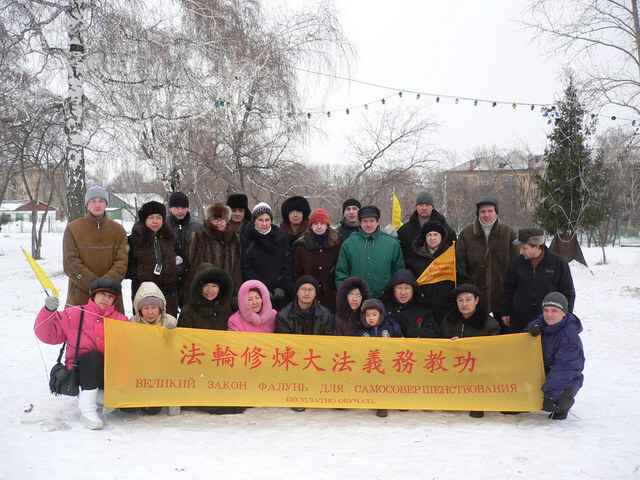 Some Russian practitioners asked, we had been distributing newspapers constantly to the Chinese for many years yet very few of them had quit the CCP. What else could we do? But in reality it was not like that, nothing was done in vain. The Chinese in Russia often mentioned our newspaper. They were all surprised to read this kind of news in various Russian cities. Gradually, from knowing, they started thinking, eventually they would cast aside the party culture in their minds. Chinese practitioners could talk to them directly. In his or her own way, every practitioner could reach the grand aim of saving people together. As long as our understanding was clear and unwavering, we could save the people through distributing the newspapers and leaflets. Many participants met one another for the first time at the conference. Even though they did not know one another well, the atmosphere was warm and harmonious. One female practitioner said that she did not shed one tear through three years of persecution and mental torture in China. But when she was sharing her experience at the conference, she could not help but burst into tears. The conference was immersed in total harmony. Sincere appreciation to practitioners in Krasnoyarsk for successfully hosting this Fa conference! The "Chinese People" are Not the "Chinese Communist Party's People"